[or 3:5-7; 5:2–6:1, 27] Circumcision of the males born in the wilderness. or 23:1-9, 21-25] King Josiah’s religious revival. That was 13 years ago. I have other memories from childhood Passovers that are as clear, like the year I put together a little model of a seder table with 18 place settings (that year’s attendance) that included 18 little aluminum foil kiddush cups. Or the year I got the mumps after the seder but during the holiday. But the last 13 years are more of a blur as I look back. I remember enlarging the pages of the haggadah so my mother could follow along. I remember the year she was in Lankenau or rehab and we transmitted the seder to her by phone until she dozed off. As years went by, my mother became increasingly confused about the calendar and what had happened to whom when, often conflating incidents. One manifestation was her anxiety about the seder, starting months ahead of time: Who’s doing what? Was there anything she needed to do? What about the (fill in the blank)? And our responses were 1) Everything is or will be taken care of and 2) The seder isn’t for another 8 months anyway. But one thing she never became befuddled about was who we were, and for that I am grateful. I wish you all a “zissun Pesach” (sweet Passover). This disorder seems to occur in a social context. Frequently, groups of women experience PPCD simultaneously. Presumptive symptoms: Spring time frame. Patient is a woman, although entire households can be affected. Patient reports insomnia. Patient has red hands. Patient has a heavy odor of cleaning substances. Patient does not have time to talk about it. *There are reports of cessation of symptoms if they are taken away to a hotel for a week each year. Legos have always been a critical part of the modern Jewish experience… unlike … competitive board games – which always ended with someone crying, Legos provided the exact opposite. It built relationships by bringing together the worlds of all 4 sons. It allowed the inner architect to become a skyscraper maker, the warrior to build a battlefield, the car driver to build the ultimate driving machine. Legos built our shabbos afternoon homes. It unified our wacky family dynamics and helped us all see whatever we could imagine was possible. So it makes total sense that there is a wave of Passover led lego efforts. I am sure there are many who have great ideas to add to this. 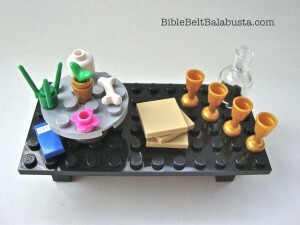 But from the original minds of http://www.thebricktestament.com/ and http://biblebeltbalabusta.com/ I think we are just getting started…. 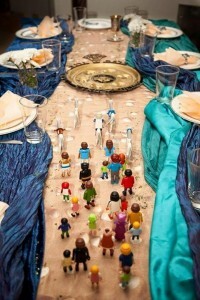 There needs to be a LEGO haggadah asap. The Seder Sidekick is a huge compendium of information, jokes, and songs for the holiday, put together by the folks at bangitout.com . If you don’t “get” the humor about any of these, you can figure it out from the Seder Sidekick. Or ask me. This entry was posted in Uncategorized and tagged cleaning, Exodus, Jewish holidays, Joshua, Josiah, Leviticus, Moses, numbers, Passover, sacrifices, seder, ten plagues. Bookmark the permalink.